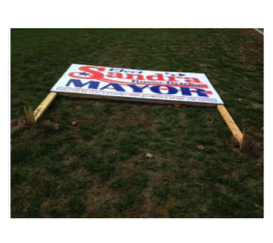 Middletown CT, October 17, 2015: Linda Bonaiuto-O’Hara reported today that residents, supporting Republican candidate Sandra Russo-Driska and members of the Republican under ticket, awoke to widespread destruction of lawn signs on private property. The campaign has filed a police report with Middletown Police. Property owners are cooperating with police as they look for the person(s) who caused the destruction and trespassed on private property. Property owner’s are also reviewing any security camera footage and will be turning over evidence on the crime spree. Anyone with information is encouraged to contact the Middletown Police Department. It's no secret that, yes, I burned one of Dan Drew's signs. I've been called everything from an arsonist to a thief. First let me defend that action; I was on my way back from a meeting, when I passed Democratic HQ, and did a doubletake and went in, and asked for a Dan Drew sign specifically. And well, the rest went up in smoke. Pun intended. Anyone who purposefully damages and destroys other peoples signs, and limit it to a particular party, is a criminal act, and should be prosecuted. I'm not a hypocrite saying this because I obtained mine legally, and exercised my first amendment right. This is vandalism plain and simple. Further, I realize that this is my "opponent", as it would seem, but as has been my view, our positions on issues are too similar. This isn't about democrat or republican; its about putting the right person in office. And to the person that did this, it doesn't matter. You destroyed property, not the resolve of the people, and we're coming still, and this just burns the fire hotter. They destroyed another person's property, and were trespassing in the 1st degree. You did neither by obtaining the Drew sign and burning it on your own property. Drew is done. He's lost a lot of support. He can go find a job out of town, where the people who supported him are from. He's a phony. A true politian. Middletown deserves better. This happens every year to GOP signs nothing new here. Signs get stolen from private property yet Democrat signs are allowed to remain illegally on Public property such as medians. There has always been a double standard in this city, this candidate shouldn't be so surprised. A better question to ask is why has this not been more publicized? A few months ago there was repeated thefts from a local cemetery and it was all over the news. Why has this not received similar coverage? This is clearly a crime spree, and especially with the fact that it is politically motivated, you would expect it to receive more publicity than it has. I asked Mayor drew, via Face Book, if he would publicly condemn these actions. He has failed to respond, therefor, one must assume that he condones this behavior. I for one am not shocked as this is a yearly issue with signs being destroyed,and it always seem to be republicans whose signs get trashed or destroyed. 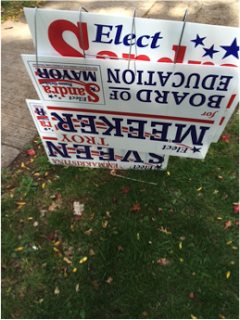 Some things never change in Middletown and regretfully this is one of those things that give politics a bad name.